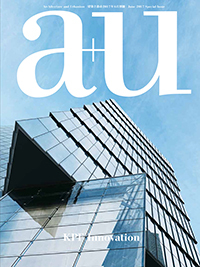 This issue is a special feature on KPF (Kohn Pedersen Fox), a New York-based architecture and planning practice with offices in London, Shanghai, Hong Kong, Seoul, and Abu Dhabi.Founded by A. Eugene Kohn, William Pedersen, and Sheldon Fox in 1976, KPF recently celebrated its 40th anniversary. As current President James von Klemperer stated, “From the scale of a brick to a building, and ultimately to a city,” KPF designs are finely tuned to their surroundings and exhibit a careful attention to craft. In this issue, we will introduce KPF work in various cities, exploring 17 recently completed projects across the Americas, Europe, the Middle East, and Asia.